In the afternoon after my shift I decided to throw on my climbing skins and head up the Tuckerman Ravine Trail (picture to the left) the 2.4 miles up to the Hermit Lake Shelter where you can access the Sherbie. This trail gains about 1,800' feet of elevation with a moderate grade. The hikers that I came across had some good floatation devices which are definitely recommended on trails that are less traveled, if you are staying at the Joe Dodge Lodge you can demo these devices for free. The Blanchard Loop Trail is an easy 1 mile (1.6 km) trail that goes around the perimeter of the AMC Visitor Center. There are numerous locations that you can access this trail. I decided to start on the Tuckerman Ravine Trail which is well packed down right now with all of the heavy traffic there has been on it. After a few hundred feet you then take the first marked trail you will see on your right (Old Jackson Road) and follow this down to the next intersection with the Blanchard Loop Trail, this continues a ways until you reconnect with the Tuckerman Ravine Trail which then connects again with the Blanchard Loop Trail and then intersects with the John Sherburne Ski Trail ("The Sherbie"). This section of trail is flat for most of the way with a very slight elevation loss; as you will feel the climb on your way back (picture to the right). When I intersected with the Sherbie I met up with another skier who had just skied this trail, and said that the conditions were still great after the few inches of snow we received today. The ski to Zealand Falls Hut in Crawford Notch is one of my favorite backcountry ski tours; it is an easy 6 mile (one way) trip to one of the three winter huts which you can use nordic skis. There are two routes you can access this trail, one is by taking the Zealand Road (FR 16) for the first 3.2 miles which then connects to the Zealand Trail for the final 2.8 miles. This road is an easier trail, although the Spruce Goose Trail is also considered an easy ski trail, and is a good alternative to take if there is logging on the Zealand Road. The Spruce Goose Ski Trail is 4.1 miles, very well marked with blue blazes and parallels the Zealand Road and then connects with the Zealand Trail. The last 0.1 mile of the Zealand Trail you will not be able to ski, but everything before has perfect skiing conditions! Go visit the Mount Washington Observatory for the latest weather conditions and be sure to check in with Mount Washington Avalanche Center for avalanche bulletins as we now have general advisories in effect! 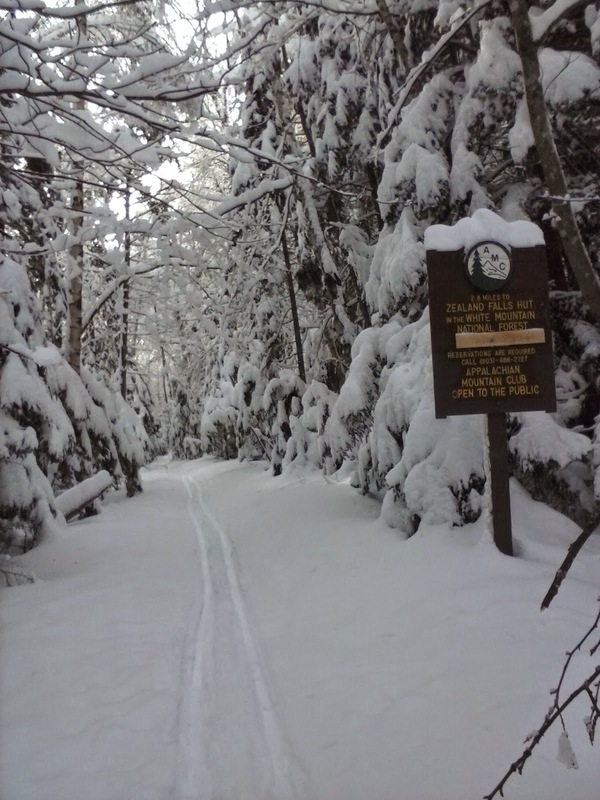 As always you can check AMC Conditions for the latest report from the snow stakes and/or call us here at Pinkham to see what we're seeing out our windows and for the best trail advice we can give you! The AMC also offers clinics and group trips for ice climbing, skiing, snowshoeing winter mountaineering and avalanche classes. All of our programs for the '14/'15 season can be found on our Activities and Events Page. 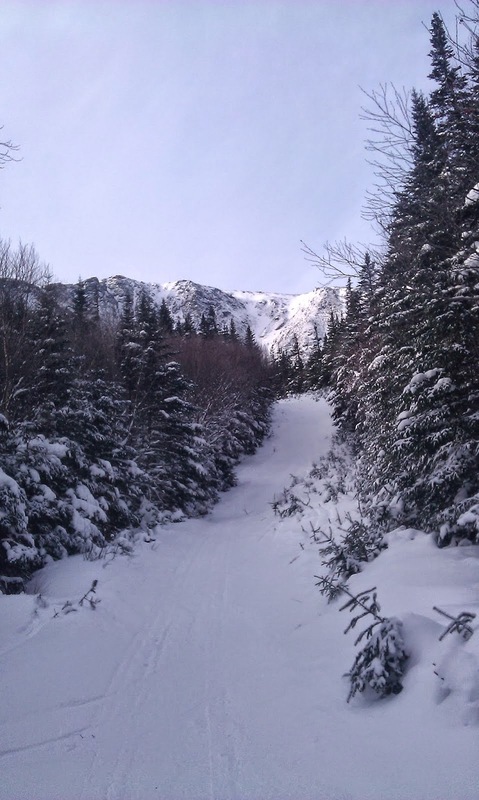 For any general questions, conditions information, or trail advice, please feel free to contact us here at the Pinkham Notch Visitor Center front desk. We are available by phone at (603) 466-2721 every day from 6:30 AM to 9:00 PM or by email at amcpinkhaminfo@outdoors.org. To make reservations at AMC Lodges and Huts, please call (603)466-2727 available Monday through Saturday 9am-5pm.